No doubt the pastors reading this will get questions in Bible study on this issue. 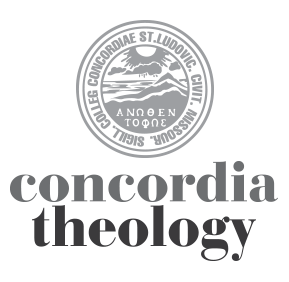 So we’ve invited two NT profs at Concordia Seminary, Jim Voelz and Dave Lewis, to interact with these issues. Dave’s observations are found below, Jim’s are available here. It was about two months ago when the media was all abuzz over remarks made by Sarah Palin. In the aftermath of the attempted assassination of Gabrielle Giffords and the murder of six other people in Tuscon, Arizona on January 8, Palin released a video in which she spoke against any attempt by the mainstream media to associate the actions of lone gunman Jared Loughner’s with political rhetoric from the right. But it was one particular comment made by the former governor that really set things off: According to Palin, the media was engaged in “blood libel” by trying to make a connection between Loughner and conservatives. Pundits and news commentators (mostly on the left) responded that Palin was insensitive to use words that recall the history of Christian anti-Semitism. The words blood libel, it was said, refer to an accusation Christians once made against Jews, the accusation that Jews used to kidnap and then ritually murder Christian boys before Passover in order to use human blood to prepare matzos and/or to reenact the crucifixion of Jesus. But a few commentators pointed further back: The words blood libel, it was said, ultimately originate in Matthew 27:25. This verse contains a sentence unique to Matthew’s account: After Pontius Pilate washes his hands and says “I am innocent of this man’s blood” in 27:24, it says, “And all the people answered and said, ‘His blood be on us and our children.’” And so Christians have blamed all Jewish people for the murder of Jesus into perpetual time. Well, no matter what the origin of blood libel—medieval urban legend or a verse from Matthew’s passion narrative—Palin was cast as being insensitive, perhaps even racist, when she, a Christian, claimed a victim status that only Jews have the right to claim. And Matthew 27:25 experienced a brief moment of mostly negative publicity. Now this passage from the New Testament is in the news again. John Ratzinger will soon release Jesus of Nazareth: Holy Week (portions of which were made available on March 2). This will be the second volume in an intended three volume work where Ratzinger will present his interpretation of the Gospel accounts and his views on their historicity. Of particular interest with this volume, however, will be Ratzinger’s deliberate attempts to talk in new ways about some NT passages that Christians have used in the past to justify anti-Semitism. And one of these passages will be Matthew 27:25. Now, many who read the above preview could interpret it to mean that Ratzinger will use historical criticism guided by his own feelings and/or agenda to come up with interpretations that many 21st century world citizens will find acceptable. They could then note further that most of what Ratzinger will say has actually been said before. But because Ratzinger is better known these days as Pope Benedict XVI, then many people may listen to what he has to say. No matter the laudable nature of Ratzinger’s goals—trying to combat the misuse of the New Testament passages to promote anti-Semitism—it still falls to us to be concerned about whether Ratzinger’s interpretations are exegetically sound interpretations. So, how is the Pope reading the Gospels? Jesus of Nazareth: Holy Week will discuss various elements of the Passion narratives, but let us consider now his reading of Matthew 27:25. According to the previews of Jesus of Nazareth: Holy Week, Ratzinger will contend that this statement is not “a curse, but redemption, salvation.” He will cross-reference this statement with Hebrews 12:24 to make the point that Jesus’ blood does not call for revenge, but for reconciliation. Let us dismiss for now the question of whether observant Jews would really be happy to know that the leader of the Roman Catholic Church, based on statements made in the New Testament, says that the blood of Jesus works redemption, salvation, and reconciliation for them—even if they don’t believe in Jesus. Instead, let us consider how this text should be read. We might begin by contending with the argument that Matthew’s goal in 27:25 really was, in fact, to place the blame of Jesus’ death solely upon the Jews. The chief alternative to blaming the Jews would be to blame Pontius Pilate and hence the Roman government. Some have argued that Matthew (and the other Evangelists) gives a sympathetic portrayal of Pilate. According to this view, Matthew played down the complicity of the Roman government in Jesus’ death so that his narrative would be more readily accepted within the Roman world. Nevertheless, when Christians centuries later used Matthew 25:27 to justify their hatred of Jews, well, this actually followed from a more or less straightforward reading of the text. Though promoting anti-Semitism could not have been Matthew’s original purpose in the first century, his narrative was responsible for generating anti-Semitism in the following centuries. And so today this verse should either be marginalized or reinterpreted. How is the reader to understand Pilate’s claim to be innocent? This depends in part on how Matthew depicts Pilate in his narrative. According to Matthew, Pilate knows that Jesus did not commit any crime. He knows that the authorities delivered Jesus over to him because of envy. What is more, he is warned by his wife because of a dream to have “nothing to do with this just man.” And so Pilate tries to get Jesus released by giving the crowd a choice between Jesus and Barabbas. But in this he fails. Finally he, the judge, is left asking the crowd, “What then should I do with Jesus who is called Christ?” and “What evil thing did he do?” They answer both questions the same—“let him be crucified!” In the end Pilate, the judge, consents to the crowd’s demands and, after having Jesus scourged, he delivers Jesus over to be crucified. Perhaps one could make an argument that Matthew portrays Pilate as a sympathetic character because of his efforts to get Jesus off of the hook. A better question regarding the truth of Pilate’s claim of innocence in 27:24, however, is whether or not Pilate is reliable in what he says and does. Well, if Pilate had actually released Jesus without consulting the crowd, then he might come off as reliable: As a judge he would have done the right thing and not condemn to death a man he knows to be innocent. Instead, Pilate’s attempts to avoid direct responsibility result ultimately in Jesus’ death on the cross under Pilate’s authority. So Pilate is not a reliable character (even if someone chooses to see him as sympathetic). Keep in mind, however, that from Matthew 16:21 and on the reader knows that Jesus is going to be killed because Jesus has revealed that this is His destiny. What is more, these events unfold according to the plan of Israel’s God. And so the reader knows all along that Pilate will fail in his efforts to free Jesus. But this actually makes Pilate look all the more unreliable. At any rate, the reader of Matthew certainly does not have to take Pilate’s statement in 27:24 at face value: Yes, Pilate says that he is innocent of Jesus’ blood, and he washes his hands to prove this point. The reader, however, knows that it is Pilate who “delivered Him over to be crucified.” And so, ironically, for many readers of Matthew’s Gospel the very thing that Pilate does to display his innocence—his public hand washing—is the very thing that will be remembered as making him most complicit in the murder of Jesus. Could Matthew have intended that the reader see irony in Pilate’s statement and actions in Matthew 27:24? I, for one, believe that this is the case. A parallel is found in the portrayal of the chief priests and elders in 27:3-10. These spiritual leaders quickly reject Judas when he confesses that he “betrayed innocent blood.” Their response to Judas—“you yourself see to it (σὺ ὄψῃ)—is exactly the same as Pilate’s words to the crowd—“you yourselves see to it (ὑμεῖς ὄψεσθε)—the words in Greek differing only in the number of the pronoun and verb. Both these authorities and Pilate speak in such a way as to place the blame on the other party—either Judas or the people. But the reader knows otherwise! Not only were the Temple authorities complicit in the betrayal of Jesus, they were perhaps more guilty than Judas as they actually delivered (παρέδωκαν) Jesus over to Pilate (27:2). And so in the same way, although he claims innocence, Pilate is the one who actually delivered (παρέδωκεν) Jesus over to be crucified (27:26). After rejecting Judas, the religious authorities are then depicted as engaging in hyper-deliberation in deciding what would be the right thing to do with the 30 pieces of silver that they paid Judas to betray Jesus. Their actions parallel Pilate’s hand washing: They act in such a way as to appear that they were not guilty of betraying Jesus, refusing to place this “blood money” in the Temple treasury. In the same way Pilate acts as if he is not condemning Jesus by washing his hands. But, again, the reader knows otherwise! Neither the chief priests and the elders nor Pontius Pilate are without blame in the condemnation of Jesus, in fact, they may be more responsible than the people they try to blame—Judas and the people. So it is probably not Matthew’s goal in Mathew 27:24-25 to use Pilate as an “innocent foil” to the guilty Jews in order to place full and sole responsibility on the people of Israel. The reader knows that Pilate is not innocent even if Pilate does make this claim. Matthew’s passion narrative, in fact, shows that there is more then enough sin and guilt and blame to go around. Even Jesus’ disciples are guilty for their betrayal, denial, and desertion of their Lord. Only one character is innocent, and that is Jesus. One point that should then follow from this, then, is that anyone using Matthew 27:25 to place sole blame on “all the people” has not taken into account the entirety of Matthew’s passion narrative. Nevertheless, Matthew 27:25 is a key passage in this narrative: “All the people” may not bear all the guilt, but they are guilty. John Nolland discusses the place of the statement in 27:25 in the overall narrative of Matthew’s Gospel (see John Nolland, The Gospel of Matthew (Grand Rapids: William B. Eerdmans Publishers, 2005), pp. 1178-9). Nolland notes that in this verse Matthew uses the word “people” (ὁ λαὸς) instead of the more typical “crowd(s)” (ὁ ὄχλος / οἱ ὄχλοι). It is “all the people” who say “his blood be on us.” According to Nolland, the significance of this is that the same word (“people” ὁ λαὸς) is used in Matthew 1:21: According to the angel’s announcement of Jesus’ birth to Joseph, Jesus’ purpose and mission will be “to save His people from their sins.” The word “people” in 1:21 probably refers to the nation of Israel. In Matthew’s account Jesus is depicted as Israel’s Messiah and King who has come to initiate God’s reign and He does this first among the people of Israel. See Matthew 10:5-6 (and compare Romans 3:16). But as the narrative of this Gospel continues, the reader finds that the people of Israel reject Jesus even as He initiates the Kingdom of God among them. This rejection reaches its climax in the events depicted in Matthew 26-27. How do “all the people (of Israel)” view Jesus in the end? Well, they demand His death and are willing to take the responsibility (even as Pilate tries ineffectively to avoid responsibility). What is more, Matthew is also clear that national Israel’s rejection of Jesus was sin against the God of Israel. Matthew is also clear that this sin will bring about judgment. This judgment is foretold in Matthew 24 and, we can say from our perspective, it was fulfilled in the events of AD 70. Therefore, these points must be made in regard to what Matthew’s Gospel as a whole says about the nation of Israel, and this no matter how unpleasant or “politically incorrect” it may seem in the 21st century ears: The nation of Israel did sinfully reject Jesus, their Messiah and King. The nation of Israel was guilty of Jesus’ blood (even if the Romans were also guilty). The nation of Israel was punished by the God for this sin—and this punishment took place in AD 70. Given the entire narrative of Matthew, then, the statement in 27:25 represents the people of Israel’s ultimate rejection of Jesus, their Messiah. By the end of Matthew, then, the locus of the people of God has shifted from national Israel to Jesus and His disciples. What then can be said of Ratzinger’s reinterpretation of this passage in light of the narrative of Matthew? Ratzinger’s argues that this statement should be read as a blessing (and so a benefit to the people who said it?). Jesus’ blood is now understood in terms of His sacrifice on the cross and its redemptive value. To justify his reading of Matthew 27:25, Ratzinger references Hebrews 12:24. Here Ratzinger employs what some of us might identify as a “gospel-handle” approach: Both passages speak about the “blood of Jesus.” The straightforward meaning found in the passage from Matthew is not congenial to the goals of the interpreter, so the interpreter imports meaning from the Hebrews passage to allow for a more congenial reading of Matthew. The fact, however, that Ratzinger must use the Hebrews passage to defend his new reading of Matthew 27:25 indicates that this new reading is not based in the content of Matthew. One way that Ratzinger’s reading can be defended would be by arguing that Matthew is intentionally employing irony in Matthew 27:25: What the people have said is indeed true, but it is true in a way that they did not intend. They are accepting responsibility for murdering Jesus. But we, the readers, know that Jesus’ blood shed on the cross is sacrificial and redemptive. Thus the people, even though they mean to take responsibility for Jesus’ death, are in reality being blessed by His sacrificial death. All the people say, “Let his blood be on us and our children.” And then by shedding His blood Jesus does save His people from their sins—even if the people in the narrative are not aware of this. Such a reading could be further defended by noting how Matthew seems to have employed irony in a number of passages in his passion account: In 27:17-25, for instance, Pilate offers the crowd to choose between Barabbas (whose name means “son of father”) and Jesus, and the crowd chooses Barabbas over Jesus. Unlike the crowd in the narrative, the reader knows that it is Jesus who is the Son of the Father. In 27:27-30 the Roman soldiers mock Jesus by dressing Him up as a faux king and addressing Him as “the King of the Jews.” Later in 27:37 the charge on the cross reads “This is Jesus the King of the Jews.” People then mock Jesus with regard to this charge, which, as with the soldiers, none of them believes to be true. But while these characters in the narrative use the charge against Jesus as an opportunity to mock Him, the reader knows that the statement on the cross is true. Since Matthew may have been employing irony in passages like these, the reader could consider the possibility that irony may be intended in 27:25 as well. Note, however, that looking for irony here may not necessarily express the meaning argued by Ratzinger and others. For instance, it is likely that the people as characters in the narrative do not understand their statement to be a curse since they do not believe in Jesus and do not expect to be judged for demanding Jesus’ death. The irony, then, would be that the reader knows that this statement is indeed a curse even if the people in the narrative do not know this. Note then how Ratzinger’s statement on this passage does not really make a choice between a straightforward reading of the passage and a reading the looks for irony. It is really a choice between two different readings that see irony, one where the statement counts as a curse and the other where the statement counts as a blessing. So, even if irony is used in Matthew 27:25, how one interprets the irony could depend to some extent on the presuppositions—and also the agenda—of the interpreter. If the interpreter is out to find a reading of this passage that is more congenial to the task of marginalizing any interpretation that would attach the blame of Jesus’ death to the nation of Israel, then the interpreter is likely to choose the option that the people are wishing a blessing upon themselves without really knowing it. It is not clear at this point, of course, if Ratzinger will argue that Matthew is using irony to defend his reading of Matthew 27:25. But note these three points: First, Ratzinger’s reading can only be defended by arguing that Matthew is employing irony here and so that Matthew intends this other meaning. Second, this interpretative move is not necessarily obvious and so there is nothing to force Ratzinger’s interpretation over and against either a more straightforward reading of the text or viewing the irony of the statement in terms of it being a curse. And so, third, Ratzinger’s interpretation seems to follow more from his goals of coming up with a new understanding of this text in light of its interpretative history than taking into account the author’s purposes and intentions. Or perhaps the previews of his book are misleading and Ratzinger will add more substance to the views expressed in the previews. Nevertheless, to combat anti-Semitism, a Christian reader may best use our Lord’s simple exhortation in Matthew 7:12 instead of marginalizing or reinterpreting Matthew 27:25. Hope this finds you and your family well and prospering in the Lord. We miss you. Joely Tynes,soon to be 12, baptised at Grace, March 6th. .
Wow! It is a wonderful and pleasant surprise to hear from you. We are doing well. I hope that you too are well and prospering in the Lord. How are John and his family? We remember John’s kindness and generosity when Marissa was born (now almost 10 years ago!). I miss you also and think of you often. Thanks for sharing the word about Joely! Blessed Holy Week, Professor Lewis! Just one quick note: it’s Joseph Ratzinger, not John Ratzinger. I’d be curious if you’ve had a chance to persue the book or at least the relevant passage and if it has any impact on your analysis. The image is the painting Christ before Pilate (1881) by Mihály Munkácsy. You can find more information about the painter, including a file of this painting at http://en.wikipedia.org/wiki/Mih%C3%A1ly_Munk%C3%A1csy.